Hello everyone! It's time for another Top 5 Wednesday! This week's theme is one that I'm super excited about and can't wait to share with all of you. 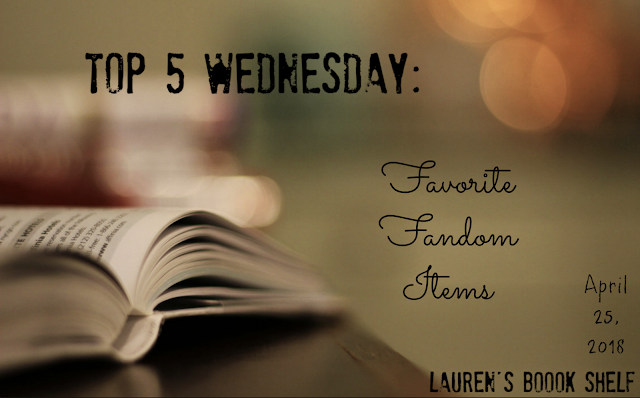 For this week, we're talking about our Top 5 Fandom Items! I have a lot of merch and fandom items that I absolutely love. Feel free to drop your favorites in the comments below and we can discuss together! #5. This for me is anything Sarah J. Maas or Harry Potter. Will buy pretty much anything that deals with either of these two fandoms. As they're my two favorite fandoms, it should be no surprise that this is the case. #4. I love character cards. I have the Shadowhunter Tarot cards (link here) and I absolutely adore seeing all the characters. I also have a set of The Hazel Wood character cards and I can't wait to read the book so that I can enjoy these cards more. I also will be getting a set of the Furyborn character cards in the mail soon from my preorder and I'm beyond excited! I just love putting faces to descriptions! #3. Some of my favorite pieces of merch are from HappyHelloCo on Etsy. This shop makes gorgeous magnetic bookmarks of book characters as well as keychains and pins. I have so many Throne of Glass and A Court of Thorns and Roses inspired bookmarks and keychains and I plan on getting so many more! #2. I love my Helion candle from A Court of Candles. Helion was one of my favorite characters in the third ACOTAR book by Sarah J. Maas and when the seller announced that his candle was limited edition and only available for a few days, I knew I had to get it. It smells like summer and sunshine and happiness. #1. My absolute favorite item is my ACOMAF book sleeve from Book Bud on Etsy. I has one of my favorite quotes from the book on it and the design is just beautiful. It's also big enough to fit ACOWAR and so I just love it even more because of that! Well, there you have it: my top 5 fandom items! Thanks for reading. Stay tuned for a new book review coming Friday!!! 15 Thoughts While Reading "Sky in the Deep"
Book Sleeve Comparisons and Reviews!